Several days ago I began getting audio messages wherein a black claiming to be affiliated with the security guards was saying that on 2nd November blacks would shut down Johannesburg airport and they would then begin killing “makwere kwere” (foreign blacks like the Zimbabweans) and “gundani” (black traitors – i.e. blacks who are giving information to whites). He said that they would also begin machine-gunning down the whites. So that is what is predicted for today. I listened to Afrikaans and English audio translations by whites of what the blacks said. I was going to do a short video about this to give my views. But due to lack of time I did not get to it because I was so busy with Farm Murder and Farm protest stuff. So I’m just going to say a few things briefly here. I began investigating the matter including contacting a security company in my area and also a Security company owner I know. The Security company owner said that there had been negotiations with the trade unions and an agreement had been reached. He said that if anything is done on 2nd November that it would be illegal. I learned that Chubb in my area was striking this week already and later I learned that Chubb would be striking in Roodepoort on the 2nd. Julius Malema and his EFF were also going to take part in this strike. There have been various news items released by various organisations including Afriforum regarding the strike. 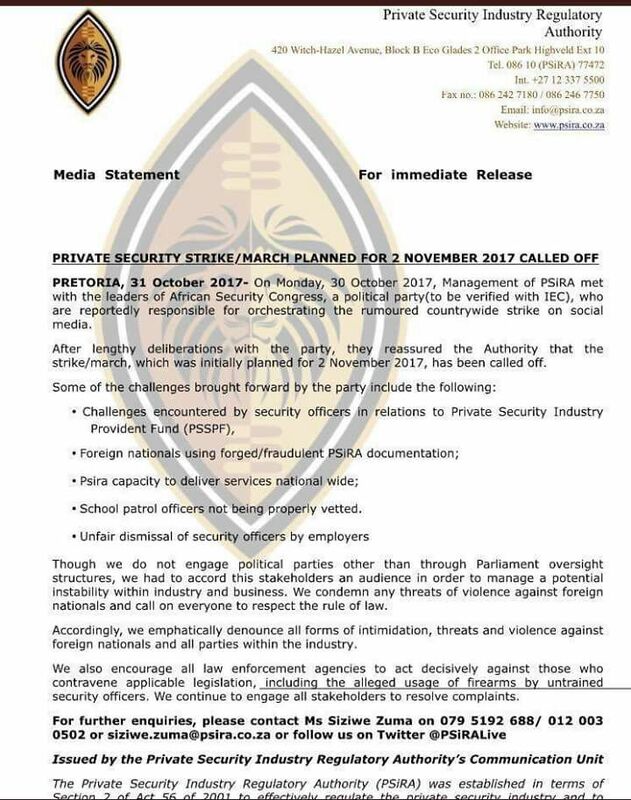 Here is an announcement about the strike by PSIRA – the regulator body of the private security industry. In my own analysis of the message from the black which was in one of their languages, there were various things that made me doubt this is real. The insinuation by the whites who translated this is that these blacks could be starting a genocide us today. But I am very skeptical about such things. What is possible is that perhaps some blacks could try to kill whites. But on the whole I don’t take this matter seriously. What is clear is that the blacks have a hatred for us. My own view has become that I am totally indifferent to their feelings and I don’t think we whites should concern ourselves with how they feel. All we need to know is that we are hated and that they will try to do things against us. But I do not take genocide and race war seriously. I urge you to watch the video series that I have begun on my website here about RACE WAR. I’ve begun a big video series about this matter since I originally wrote about it in 2001. Since then my ideas have also evolved. I have however never believed that we could lose a race war. So in this series I’ll be doing very detailed analyses about the black threat to us (which is real), but why I am convinced that we can survive this and even win this. Also my latest information on Farm Murders suggests to me that the Farm Murders are actually a Military operation against us whites. Its one thing to kill whites and to use terrorism as a tactic and quite a different matter in order to achieve genocide and to kill us all. We still have a LOT of power and we are far from dead. If we face the reality of our nasty situation carefully I am convinced we can survive and even turn this against our enemies. We are NOT doomed to die by any measure. They cannot defeat us if we act as a unified group in each other’s defence.